Just like millennials, GenZ is disrupting the way learning happens in schools and educational institutions .Gen-Zers, who haven’t seen a world without technology, can be great learners if the teaching methods and strategies adopted can meet their unique needs! A GenZ student entering school or college today are over reliant on technology and has 24 -7 access to any information – Their attention spans are as low as 8 seconds (to receive a response). This change in learning and behavioural patterns of students has forced educational institutions to reconsider their methods of teaching. A recent survey conducted by the University of Salford shows that the classroom environment can affect students’ learning and academic progress by as much as 25% – Hence, schools are now gearing up to design an infrastructure that encourages active learning and create a positive learning experience for both teachers and students. Interactive learning environments give students a different way to absorb new information, rather than just reading from a book or listening to a teacher. It can mean integrating more activities into the classroom, such as introducing group discussion corners, software programs that allow teachers and students to interact in new ways, etc. This requires implementing new technology and the furniture that accommodates it. It is also essential that students are exposed to multiple types of engagement throughout the day. Hence smart classroom design is an essential aspect to ensure better learning outcomes. Development of knowledge, skills and values from direct experiences outside of a traditional academic setting is what is known as experiential learning. It is the intentional combination of experience and learning where each enhances the other. Traditional teaching styles are becoming far less effective at reaching today’s students. Several studies confirm that students learn most effectively from active engagement with progressive information and ideas; so it’s important to have an infrastructure that enables Experiential Learning to be at the heart of your learning strategy! Digitization in education has changed the process of teaching and learning entirely. Technology has made education stress-free for both students and teachers, as classrooms are increasingly becoming collaborative. There are learning tools that provide opportunities for students to be able to learn and work at their own level and pace. The advent of technology in classrooms is changing the face of education slowly but definitely – So having a classroom that is flexible enough to adapt to these changes becomes vital. 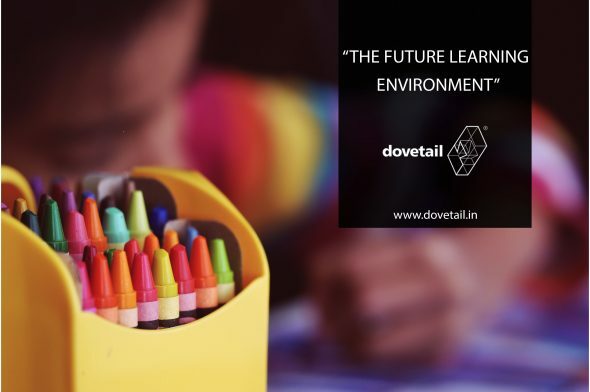 Therefore, Dovetail is launching the ‘Future learning environment’ to help schools create the next-gen learning environment. Well-planned learning environments can trigger academic inquiry by promoting interdisciplinary learning, civic engagement, career development, cultural awareness, leadership, and other professional and intellectual skills. Dovetail Furniture’s vigorous design-training combined with ergonomics and usability testing has given them the capability to create and customize furniture for various schools and educational institutions.